Inform and inspire young naturalists with this book about a very special butterfly garden. 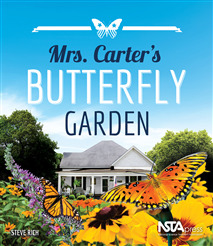 Mrs. Carter’s Butterfly Garden is the story of how former First Lady Rosalynn Carter started a front yard project that grew into a butterfly-friendly trail through her hometown of Plains, Georgia. Learn from Mrs. Carter’s example why it’s good for people when butterflies have welcoming spaces and how kids can create their own butterfly gardens at home or school.